If the inflow continues as it does today there will soon be a new tragedy both on the islands as well as in the Greek mainland. The country is not prepared, could not be prepared, to look after such large numbers of people. In fact, Europe is not prepared to host, help, protect and finally integrate such an influx. The only way out is political. Europe, the old continent, needs to act as the broker of peace. Europe needs to enforce an embargo on the sale of arms on all war -engaged governments, take the initiative in peace negotiations, offer incentives for peaceful collaboration to governments striving for peace and viable development while applying a products boycott against war- mongering governments. The European Union present leadership needs to prove to its citizens that it has a good reason to exist and it must do it now, before it is too late. The refugees problem is the tip of the iceberg: pockets of extreme poverty and discontent develop within various European capitals together with neo-fascist entities that threaten the social cohesion of the EU and not only. Terrorist attacks multiply and neo-fascist entities are on the rise. In addition, the citizens of the European Union feel threatened by the increasing pressure for more productivity and the deterioration of their quality of life. Unless the governments of the EU realise the problems and the necessity for positive and fast action we may witness its dissolution. It has been a long while since my last post. I have no excuse. The situation in Greece, social, economic, political has been such that a general feeling of insecurity and uncertainty is prevalent. The Ministry of Macedonia-Thrace of previous governments has become part of the Ministry of Interior and Administrative Reform, a “demotion” according to right wing politicians, has been given to Ms. Maria Kolia – Tsarouha. Ms. Tsarouha was first elected in her home town, Serres, in 2000, with New Democracy. 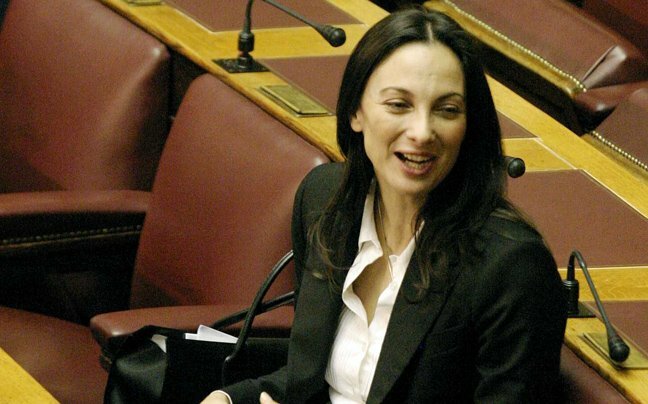 In 2012, after refusing to sign the second mnemonium, she was ousted from New Democracy and joined the Independent Greeks Party. It is considered common knowledge that Ms Kollia-Tsarouha belongs to the close circle of ex-Prime Minister Kostas Karamanlis, former President of New Democracy. Ms Eleni Kountoura is Deputy Minister for tourism. She has followed more or less the same route as Ms Kollia: from New Democracy to the Independent Greeks and now to the ministry. She is a graduate of the Gymnastics Academy of Athens and a champion athlete. True to their reputation Greek mass media concentrate on her international career as a top model….We are looking forward to her efforts to boost Greek tourism. Rania Antonopoulou, deputy Minister for the reduction of unemployment comes from the academic sector. She gave up her teaching post in Bard College to offer her services to the most difficult task of this government: unemployment. Due to her long stay abroad she is not very well known in Greece. The percentage of women in the present Parliament is 23,5%, higher than in previous Parliaments but still not as high as the goal of 33% set by the Greek women’s movement. First of February: Athens is covered in an off white sandy veil. The miniature sand storm comes from Africa and it visits Greece regularly three or four times a year. It is customary to wish each other “Kalo mina” – Happy new month – at the beginning of every month. This month the wish has a special meaning. The new Greek government is a fact. Coalition of the Radical Left (SYRIZA) has won the elections and managed to form a government allying itself with right wing Independent Greeks party. The composition of the government has been analysed according to the media’s assessment of each Minister’s news worthiness. Mr. Yannis Varoufakis, for example, has appeared on the BBC, Alexis Tsipras on every other tv station and/or newspaper. I want to speak about the members of the new government who have not reached tv star status. 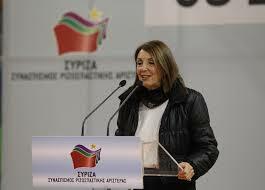 First of all in a 41 person government I counted 6 women plus the new Parliament Chairwoman, Ms. Zoe Konstantopoulou. Ms. Kostantopoulou is the daughter of a very prominent attorney (he was one of the judges in the Greek junta trial) and popular political figure, Nicos Konstantopoulos who headed Synaspismos, the major component of SYRIZA, from 1993 to 2004. Ms Zoe Konstantopoulou a well known lawyer in her own right has become famous for her spirited spats with opposition MPs during her first four years in Parliament. Everyone looks forward to her handling of her new post. Ms. Nantia Valavani, Deputy Minister at the Ministry of Finances, is a graduate of the Economics University of Athens and holds a doctorate from the Communication and Mass Media dpt of the same University. 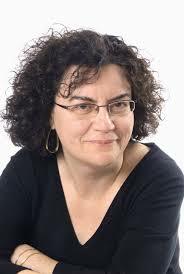 Ms.Valavani combines the abilities of a competent economist with the sensitivity of a literary critic: she is one of the most prominent Bertolt Brecht scholars. Born in 1954 she took part in the anti-dictatorship resistance originally in her native Crete and later, as a student in Athens where she was arrested and imprisoned for months. 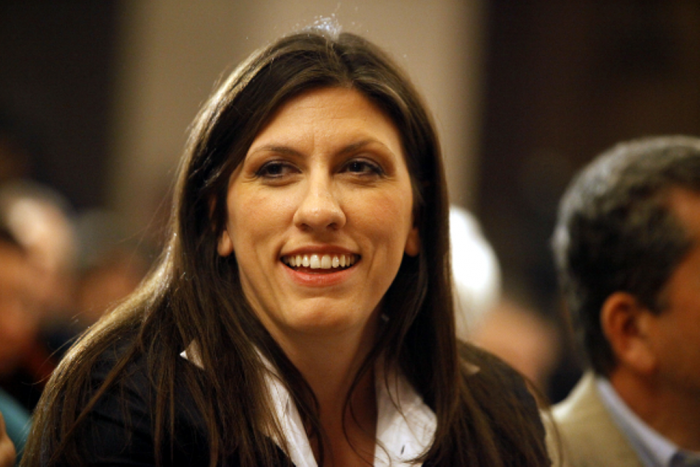 Tasia Christodoulopoulou, Deputy Minister for immigration, is a prominent lawyer and human rights activist. With less than fifteen days to crucial national elections it is educative to watch the actions of the Greek mass media. Most of the nation-wide private channels operate with temporary licenses, with all the consequences this can have….. When SYRIZA asked in Parliament whether radio and television stations pay the required fees for the air frequencies used the government answer was cryptic….. The abrupt shutting down of the public television signalled the most massive reaction to the government’s policies from citizens of all parties. The picture today is disappointing in the majority of nation wide private tv stations. News reports are biased, foreign press reports are misrepresented, journalists coordinating panels are practically absent, allowing the loudest to rule the discussion and driving the public away… At a recent poll about what Greek people do most on their pcs the answer was “watch the news”. In a country where information technology is not an everyday word more and more people turn to internet sources to be properly informed about what happens in the world but in their own country too. 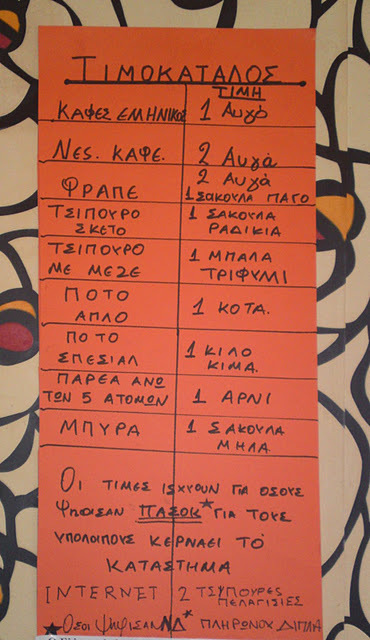 I found the best example in “Efimerida ton Syntakton” (it means the “Editors Newspaper”(http://www.efsyn.gr/arthro/mega-polemaei-den-metafrazei). They have a picture from MEGA channel’s news where the name of the rising, Spanish left wing movement “Podemos” is translated as “polemos” which in Greek means war!!! 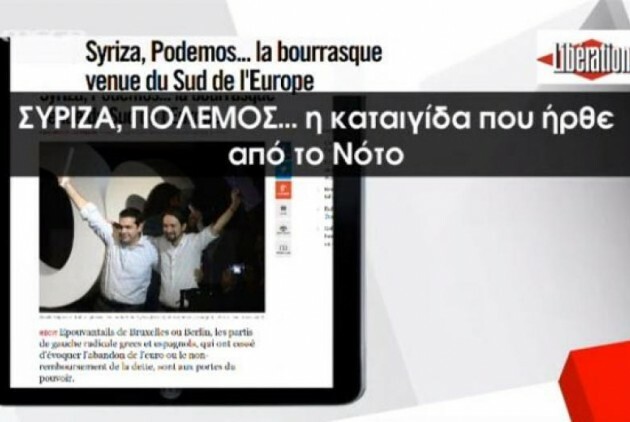 This “lapse” appeared to link SYRIZA with war!! We need to resist the totalitarian attitude of the Greek government who, in the name of an elusive “development” has started a war against anyone who disagrees with its measures. We need to express our solidarity and support to the many people suffering by this attitude. 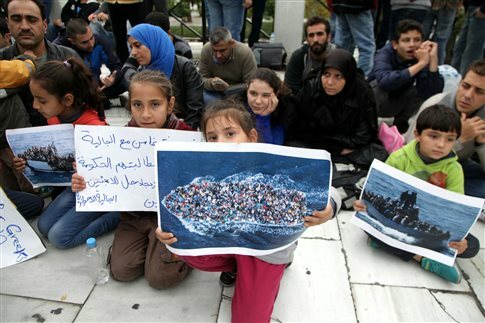 A modern Bethlehem has been set up in Syntagma Square: Syrian refugees, among them children and one pregnant woman, have started a hunger strike to be given traveling documents to reach other parts of Europe. A SYRIZA MP has expressed his decision to join them. 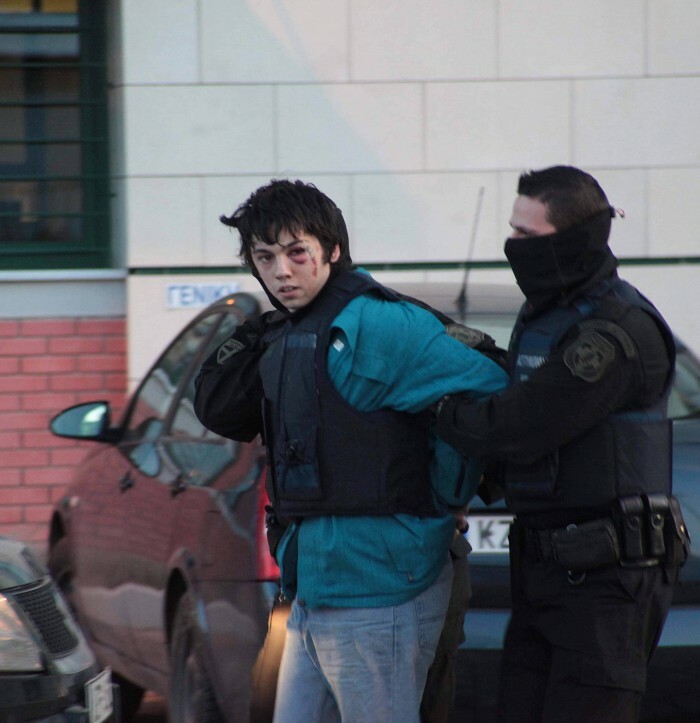 Nicos Romanos, a 20+ armed robbery convict, has passed his University Entrance Exams while in prison but is being refused permission to attend classes. He is on hunger strike for over two weeks now and his health is in danger. Romanos first came to the limelight because he was with Alexis Grigoropoulos the night he was shot and killed by a riot policeman. In spite of the police efforts there is no proof that the young man was ever involved in terrorist activities. In Northern Greece the attacks on environment and on the populace trying to protect it continue. 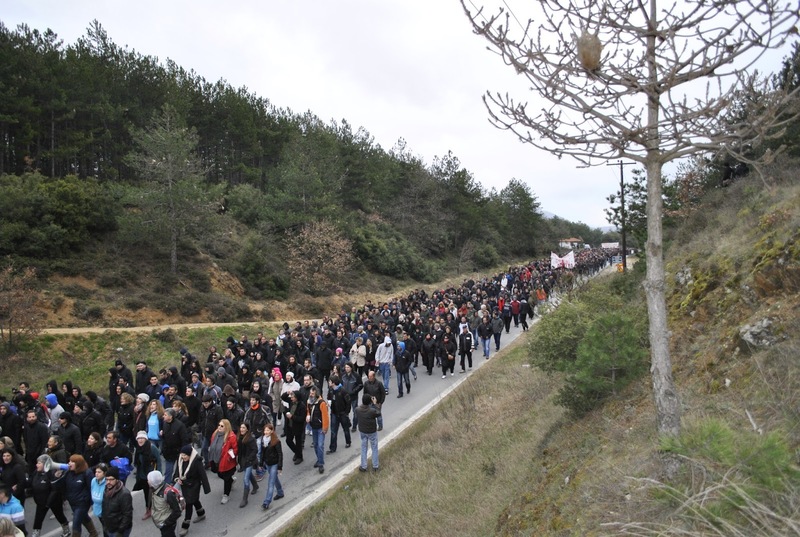 Largely ignored by the mainstream media the resistance of the people of Chalkidiki goes on. Police brutality is on the increase. After the uncalled attacks on the Disabled people’s demonstration last week there was further proof of it last night. A trainer in the police Academy has come forward andstated that while teaching one of the cadets stated “I am a fascist and proud of it”. The most disturbing feature of the incident is that it was applauded by the rest of the class. The bet for Greek society is how to resist efficiently, how to stand next to the suffering citizens without taking away their dignity.